After 2 years of development (okay I've been lazy and haven't worked most of it) Gesture Magic (the new name for Smoke Gestures) is nearing completion and reaching the alpha development stage. Computer games such as EA's Black and White use an innovative system to "cast spells" - you draw a symbol using the mouse and it will execute spell. Gesture Magic is one step further - it allows you to paint your own smoke/paint trail on your desktop, and using your pre-defined gesture actions, it can execute or run a specified action. Why would you want to draw a symbol (a gesture) using the mouse to do something rather than the conventional way of just opening a program via double click etcetera? Gesture Magic only aims to supplement your existing way of working - typically if it is quicker to click an explorer icon instead of drawing a symbol like an "e" you should do this. However, once you adapt to using gestures you may find it quicker and more fun, in addition, the final version will allow you to chain actions, and pre-record them, allowing elaborate procedures to simply be a wave of the mouse. 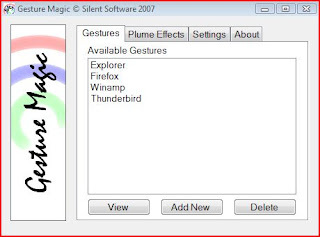 Have a look at the preview video of Gesture Magic (2.5MB AVI) to get a feel of what this software can do for you! Gesture Magic will be available this Christmas season.... hopefully!